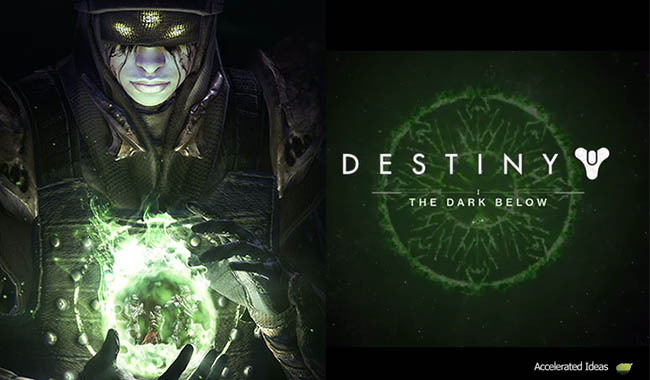 The Dark Below DLC for Destiny includes a dazzling collection of new Exotic weapons and armour. One particular weapon called Necrochasm is the ultimate DLC weapon, which can only be acquired through the Crota's End Raid. However, it's not as easy to acquire as you might think so in this post I'll explain exactly how you get it. First, we need to understand the new upgrade materials in The Dark Below. If you think back to the pre-DLC game then you have a selection of planetary materials such as Spinmetal and Hellium Filaments, but you also have Ascendant Energy and Ascendant Shards, with the former being used to upgrade weapons rather than armour. The DLC includes a new purchasable upgrade material called the Embalming Orb which players can buy from Eris (the new Vendor at the Tower). Once you reach a certain reputation rank with Eris you have the option to buy these Embalming Orb's for 10 Black Wax Idols a piece. Why would you want to buy an Embalming Orb? Because it's all part of the big changes in The Dark Below DLC where weapons can now be upgraded into different classes. For example, Common weapons can upgraded to Legendary, and Legendary to Exotic. One particular Common weapon called the "Husk of the Pit" is where it all starts for Necrochasm. Unlike other Common weapons which can't be upgraded, the Husk of the Pit has a single upgrade path which requires the Embalming Orb. 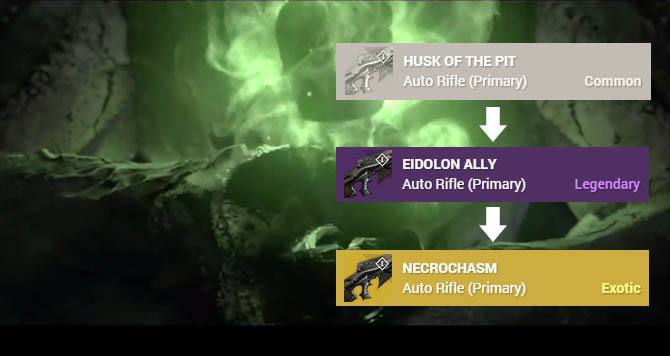 This upgrade will turn the weapon from Common to Legendary, ultimately becoming the Eidolon Ally (Auto Rifle). Some lower level players have reported that the Husk of the Pit drops when killing hive. It's not clear whether the fact that they're lower level triggers the drop of white weapons, or if higher level players can still get the Common weapon. However, the key to getting Husk of the Pit is to kill only Hive enemies. Update: A recent patch by Bungie has greatly increased the chance of getting Husk of the Pit. Players need to hunt down the Blades of Crota and kill them for a chance at claiming the Common weapon. The best way to do this is to replay the Fist of Crota mission, which was re-enabled during the same patch. The weapon drop is not a white engram as previously thought, nor a pyramid item, it's a reward item that instantly appears in your inventory. The Crux of Crota is not a purchasable material but rather a rare drop from the Crota's End Raid. Unlike the Mythoclast in the Vault of Glass, you don't simply earn the Necrochasm Exotic weapon but you win the material needed to upgrade to it. In the end it's all the same but it'll take you longer because you've got to max out Eidolon Ally to get there. The final upgrade slot of Eidolon Ally is "Burgeoning Hunger" which requires a single Crux of Crota to transform the Legendary Auto Rifle into the end game Necrochasm Exotic. So before you get to the final upgrade slot for Eidolon Ally you've got a bunch of upgrade slots along the way. Those slots require an assortment of upgrade materials including the standard planetary materials but also stacks of Radiant Energy. Radiant energy is classed as a Legendary material and can only be acquired through the Crota's End raid, either through chests of checkpoint rewards. 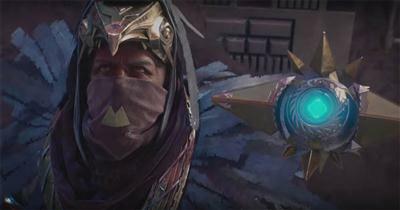 Players can also exchange Radiant Shards for Energy through Eris. Best farm spot for Black Wax Idols? Now that we've got a new purchasable upgrade material you're all wondering how to farm Black Wax Idols right? Well think back to the premise of consumables and how they drop. There are consumables for each of the different types of enemies e.g. Fallen, Hive, Vex. In this case, we're talking about a Hive consumable so you've got to kill Hive enemies for one to drop. Next up, where is a good farm spot to kill lots of Hive enemies and increase your chance of a Black Wax Idol drop? Well, you want to aim for Major's or Ultra's to increase your chances of a good drop so I'd suggest heading to Earth and start a Patrol. Then venture into the downstairs room, on the left of where you spawn. There are 3 high ranking Hive enemies that you can farm by killing them and then leaving the area and returning in quick succession.